You must join a team of expert treasure hunters as they set out for the Egyptian pyramids to uncover ancient treasures. Click here to play! If you can help these explorers safely gather their treasures you will be handsomely rewarded. 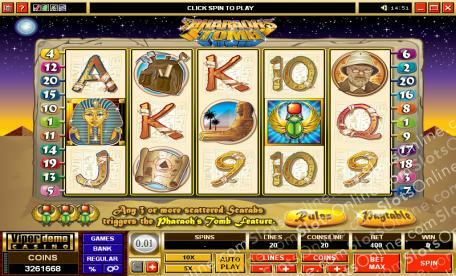 There are plenty of symbols to help you along your way in this treasure hunting expedition, including Tut's sarcophagus. This golden coffin is a substitute. It only appears on selected reels, but will help you spin in more wins. Stick close to the Professor. This expert on all things Egyptian will gain up to 3000 times your line bet if you can spin two to five of him across the reels. You'll also want to keep track of your excavation tools and the treasure map. These two symbols will get you up to 500 times your line bet if you can spin two to five across an active pay line. There are a few other symbols to help you gather your treasure, including the Sphinx. This rock structure will award up to 1000 times your line bet if you spin two or more across a pay line. Keep a close eye out for jeweled scarabs amongst the ancient treasures, as these little symbols are particularly valuable. Two or more will multiply your total bet. Three or more will trigger a bonus feature that will see you bringing in even more wins! Set out on an exciting adventure for a chance to uncover ancient treasure and bring in plenty of big money wins! The jeweled scarab symbol is a scatter. If you spin two or more anywhere on the board you will multiply your total bet by 2, 5, 20, or 100 times respectively. Three or more anywhere on the board will trigger a bonus feature. King Tut's sarcophagus is a wild. It only appears on reels 1 and 5 but will substitute for other symbols (excluding scatters) to bring in more winning lines. A bonus game is triggered if you spin three or more scarabs anywhere on the board. When the game is triggered, you will be taken to the secret tomb where you will have to choose from three different sarcophagus to find the golden key. If you choose one with a key in it, you will be rewarded a prize and you'll be taken to the next tomb. If you don't find a key, you will get smaller prize and the game ends.